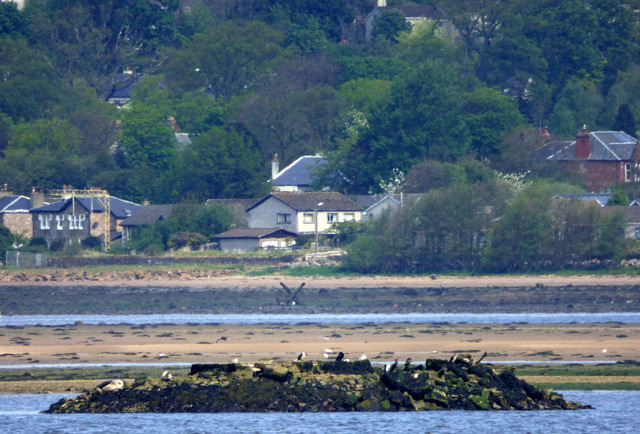 In the River Clyde between Parklea, Port Glasgow and Cardross. The lighthouse was classed as a ruin by 1914 Link . In the distance near the shore at Cardross can be seen the fallen boundary marker shown here NS3476 : Fallen boundary marker. In addition to the various sea birds which can be seen on the foundation, there are several seals on the left side (not clear in this low resolution photo). © Copyright Thomas Nugent and licensed for reuse under this Creative Commons Licence. This page has been viewed about 37 times. When the rig hit the bridge, Oasis, then a big popular band were playing in front of up to 100 000 at Balloch. The traffic chaos after that must have been something.